The site dates from the late Neolithic-early Bronze Age (approx. 2500-1500 BC) and consists of a circle of 19 stones, standing slightly below a ridge of the sloping field. First recorded in the 18th Century, with two stones lying down, the site was completely restored by 1879. The stones are equally spaced, except for a gap in the NE side, which was probably the entrance. The stones vary in height between 0.9m & 1.4 m (3 to 4.5ft) tall, and are graded so that the tallest ones are to the SW and the shortest to the NE. 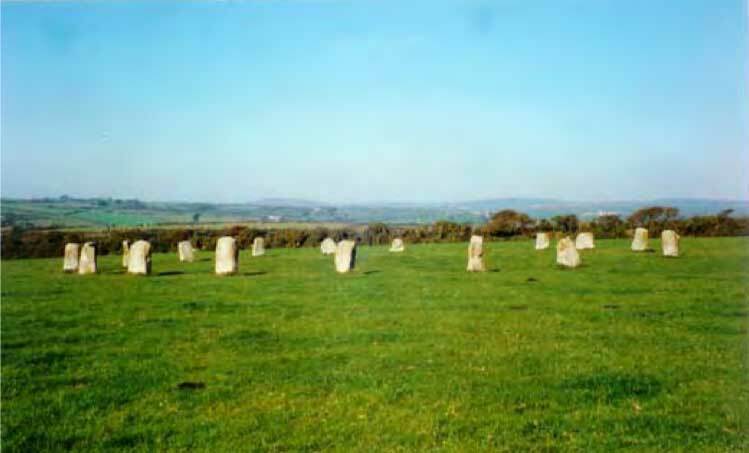 The Merry Maidens Stone Circle lies beside the B3315 road about 4 miles (6 km) from Penzance. The road goes past the turning to Lamorna valley and then about half a mile further on, the stone circle can be found in a field on the south side of the road. over a stile. No disabled access. Alternatively, cars may be left on the grass verge at the top of the field. Access is then through a gate, which could provide disabled access if it is unlocked. The Cornish name for the circle was ‘Dawns Meyn’ , which probably meant ‘dance of stones’ (dons meyn) or ‘sacred stones’ (zans meyn). The name of the Merry Maidens refers to the legend that the stones were nineteen maidens from a wedding party who were dancing in the field one Sabbath eve by music from two pipers. As the night turned into the Sunday they continued dancing to the wild music and were turned to stone for their impiousness. The Pipers were similary petrified, and they now stand as two standing stones in a nearby field. There are of course no written records from the period when the site was constructed. However, it seems likely that stone circles (of which there are more than 1000 all over Britain and Ireland) were places for ceremony and ritual. There are local variations in the style and construction of stone circles in different places, as though each local tribe or group of people adapted the basic formula for their own use. In West Penwith there are 5 stone circles including this one [Boscaswen-ûn & Tregeseal are also available as downloadable leaflets] and all have or had nineteen stones. This may relate to the 18.64 year cycle of the moon, or the 19 year metonic cycle of the moon and the sun. For ancient peoples, observation of the passage of the sun and moon, and celebration of the Earth Mother may have been linked to- gether in ceremony and ritual at places such as this site.